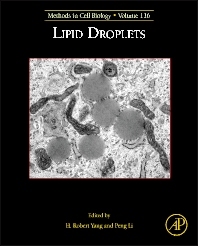 This new volume of Methods in Cell Biology looks at lipid droplets LDs, covering sections on analyses of LDs in model systems, cell/tissue-specific analyses of LDs and imaging and in vitro analyses of LD biogenesis and growth. Chapters are written by experts in the field. With cutting-edge material, this comprehensive collection is intended to guide researchers of LDs for years to come.